In 1984 only 400,000 surgeries were performed annually in an outpatient setting; that figure rose to 8.3 million in 2000, according to the Nashville Academy of Medicine. According to an article published by the American Academy of Dermatology Association, approximately 82 percent of all surgical procedures are performed in an outpatient setting, with a significant number of those surgeries performed in offices. According to the Nashville Academy of Medicine, approximately 65 percent of all surgeries do not require a hospital stay. Certified Registered Nurse Anesthetists (CRNAs) are anesthesia professionals who are the hands-on providers of approximately 32 million anesthetics given in the United States. According to a 2001 study conducted by the American Society of Plastic Surgeons, 56.5 percent of plastic surgeons use CRNAs to administer anesthesia care in an office setting. The first and most comprehensive “Standards for Office Based Anesthesia Practice” were developed by the American Association of Nurse Anesthetists and adopted in 1999. According to a 1999 report from the Institute of Medicine, anesthesia care today is nearly 50 times safer than it was 20 years ago. Emergency equipment and anesthesia monitoring devices in office facilities should be equivalent to those that would be necessary for the same surgical procedures performed in a hospital or freestanding ambulatory surgery center. 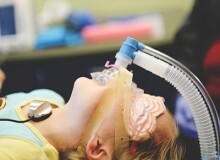 CRNAs practice in every setting in which anesthesia is delivered: traditional hospital surgical suites and obstetrical delivery rooms; critical access hospitals; ambulatory surgical centers; the offices of dentists, podiatrists, pain management specialists, plastic surgeons; and the U.S. Military, Public Health Services, and Department of Veterans Affairs healthcare facilities.